Sailing for the Marquesas later today, the hard way. Planned sailing route East through the Tuamotu and then North to the Marquesas. GRIB file snip. The weather outlook 24 hours from now shows light northerly winds. We're sailing for the Marquesas later today, the hard way. Most boats enjoy a off the wind approach to the Marquesas Islands, but we'll be headed on a 600nm northeasterly course against the prevailing easterly winds. The good news is it looks like the wind is going to go light for a few days and we can leverage our ability to sail fast in light air. Time to make last minute preparations before we sail out of the Fakarava lagoon, net stop Ua Pou or Nuka Hiva, but we have a few fall back options if the weather forecast doesn't hold. Look for more updates via Sailmail. Windy day at Rangiroa atoll with dark clouds on the way. One of the better stocked shops at Rangiroa. A sampling of the price of Coke and other drinks. One USD = 89 French Polynesian Francs so that single can of Coke is $1.68 USD and the Monster Energy is $6.32 USD. One 330ml Hinano beer is $2.88USD. South Rangiroa anchorage sand flats and stormy clouds. Unhappy kitty takes refuge on the navigation desk while a squall passes by. If you look closely you can see the squall on the radar screen. Black wall of clouds approach as lightning cracks and thunder rolls. Aranui 3 inter island trading ship sailing out of Fakarava. I wonder what's inside as it sure looks weighed down in the bow. We started our day with a beautiful and fast close hauled 30nm sail up the Rangiora lagoon. Flat water, a fine breeze and lots of boat speed. Arriving at the pass we sailed right out on an ebb current and are now making our way toward Fakarava atoll, 140nm distant. The course demands our attention as we're weaving between 4 other atolls. And will be passing within less than 4nm of Arutua atoll, 5nm of Kaukura atoll, 8nm of Apataki and 3nm of Toau atoll all during hours of darkness. The scary thing about these atolls is there is very little land mass in the form of motus to provide a radar return. Waves crashing on reefs within a few miles of the course is unsettling. Add in intense squalls with brilliant lightning and pounding thunder rumbling the hulls and one gets a little worried. Even a near strike could blow our navigation electronics back to the stone age, leaving us to navigate like the original Polynesian voyagers in their Vakas. Aside from the beautiful weather for the morning sail we've been battling some monster squalls and had some lousy luck fishing. The squalls have been huge at 6-8 mile wide and full of nasty strong winds that have whipped the sea into a wild frenzy. To be on the safe side we strike our mainsail for the big squalls and sail on jib through the chaos of gusts and confused seas. On the fishing front we managed to hook up with three huge fish. The first almost spooled our big Penn reel and it was literally smoking hot and smelled of burning plastic as we raced to drop sail to fight the fish. By the time the jib was furled and main was hastily dropped only a tiny bit of line remained on the reel and then the line went limp. After reeling in 600 yards of line we found our lure missing as the result of broken swivel. Whatever it was it was too big so the Long distnace release proablly saved us more than a hour of fighitng the fish to just release it for being too big. After raising sail and getting underway it was less than 20 minutes until the next fish sent us racing to drop sail, this fish was huge as well as it broke the 50 pound mono main line. A third attempt at catching had yet another fish break the 220 pound stainless leader on the last of my favorite lures. So, my three most favorite lures are lost and no fish to show for it, just lots of unneeded practice of striking and raising sail. My 'z' key on my laptop broke a few months ago. What a pain. I have to rely on spell check to add the 'z' by typing a word like freny which it corrects to frenzy adding the damn 'z'. The only problem is that for some words spell check just can't guess correctly so I have to misspell another word and copy and paste the missing letter. Often I just rewrite my sentence with an alternate word to save the hassle. Recently, I've switched to my wireless keyboard and guess what keys aren't working? Yes, it's the 'z' key again and now 'x' is on strike as well. If they convince 'y' to join the walk out I'm, throwing the keyboard overboard. Ahh, the joys of a boring 3am watch. Trying to stay awake by writing a blog post to stay awake so Kathy can get some more sleep before I hand over the watch. I'm calling it a night as it's almost morning and I'm looking forward to 3 hours sleep as Kathy takes the helm for a while. It's our eleventh day here in Rangiroa and it seems like we've been here forever. It was our intent to stay a few days then sail to the Marquesas or at least another atoll further East like Manihi or somewhere southeast like Fakarava. Unfortunately, the weather hasn't cooperated with our plan. The day we arrived in Rangiroa we made a quick trip to shore for some fresh baguettes and that was pretty much it for the day. On the second day we went to visit the Gendarmerie (National Police) to officially check-in to French Polynesia. It was a long walk, so after 30-45 minutes in the baking tropical heat, we spotted a Gendarmerie driving past and flagged down the car. We asked where we could find their office, but they didn't speak much English and our attempts at French were questionable at best. We finally got the gist that the cop shop was three more kilometers and they got the gist that we were off a sailboat and need to 'make the first touch'. We continued on our way and about 5 minutes later the Gendarmerie (police car) came back by and offered us a ride. I mimed the question of whether they were going to cuff us before they put us in the back of the car, this got a good laugh. Once at the police station it was a bit of a struggle to get the basic paperwork completed. I think it's very unusual for a boat to 'make first touch' (check-in) to French Polynesia at Rangiroa atoll, but the staff were super friendly. We continued walking toward the village, Dave was pretty sick after the passage from Penrhyn atoll, he'd been nursing a sore throat for more than three weeks. The suspected cause was swimming in the filthy Pago Pago, American Samoa Harbor while cleaning the boat bottom. The sore throat just wouldn't resolve on it's own, so we found the private local doctor. We could have gone to the local clinic, possibly for free, but the timing and availability of the private doctor made the 3600 French Polynesian Francs worthwhile. The diagnosis was strep throat, but that was just a guess as no culture was taken. Eight days of amoxycillian and he's feeling mostly better, but still nursing a nagging unproductive cough. Looking back, we wish we would have taken advantage of the calm weather that helped us get to the Tuamotus and kept moving toward the Marquesas. It seems that the normal trade wind pattern has reestablished over French Polynesia and the likelihood of a tropical depression to interrupt the trade winds this late in the season seems very unlikely. We've been experiencing lots of squalls and rain here, nothing with the intensity of Pago Pago, but not very nice weather. 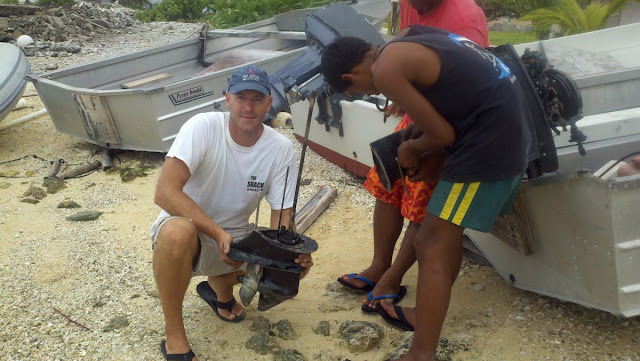 The anchorages near the primary villages at Rangiroa offers no south protection, so it's been a little rough at times. 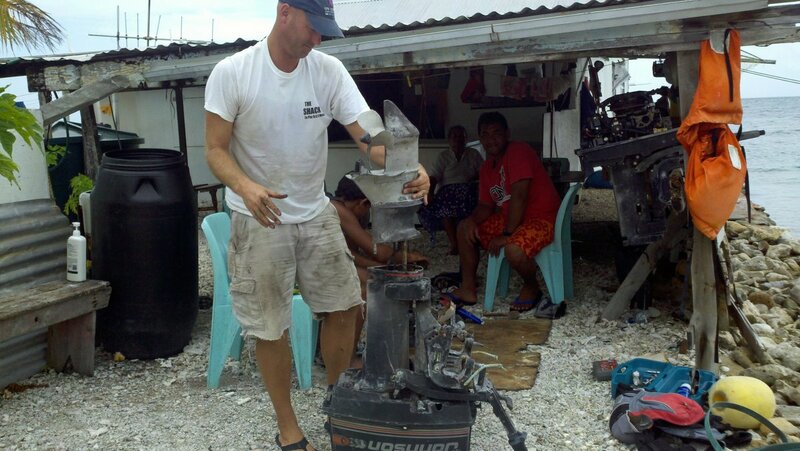 There's a Shell gas station on the motu so we've fuel up the boat via jerry jugs and done a bit of shopping. Believe it or not we've scored beautiful fresh broccoli a few times from the local shop. Otherwise vegetables and fruits are most likely to be found in a can. Despite the marketing hype, we found drift snorkels through the pass to be under whelming. We didn't even see one shark! The commercial pay for service WIFI provider on Rangiroa has apparently been on vacation as the service has been down the entire time we've been here. So, no internet to keep us entertained on rainy days. With south winds predicted, we've moved 30nm down the lagoon to the southeast corner to find a nice protected anchorage. The anchorage offers great protection and we're enjoying the new scenery. Today we braved the rain and wind and visited a few of the motus. This area of the lagoon is unique with miles of super shallow sand flats and emerald colored water. Check out for yourself on Google Earth. 15°16.3573 S 147°14.7828 W.
I hope everything turned out well for 'Tebriz IV' as we found their man overboard safety device on Penrhyn atoll. This plant seems to thrive on sea air and salty coral rubble for soil. Turtle shell found in the pearl shed of an abandon pearl farm in Penrhyn atoll. Getting the coconuts can be a bit of chore. What more could you need than a calm anchorage and a fresh bananas? Book exchange at the old pearl farm has seen better days. Kathy wielding the machete and warning me I'm not allowed to bring home any of these cockroach infested books. Easy for her to say she has a Kindle with thousands of e-books to read. 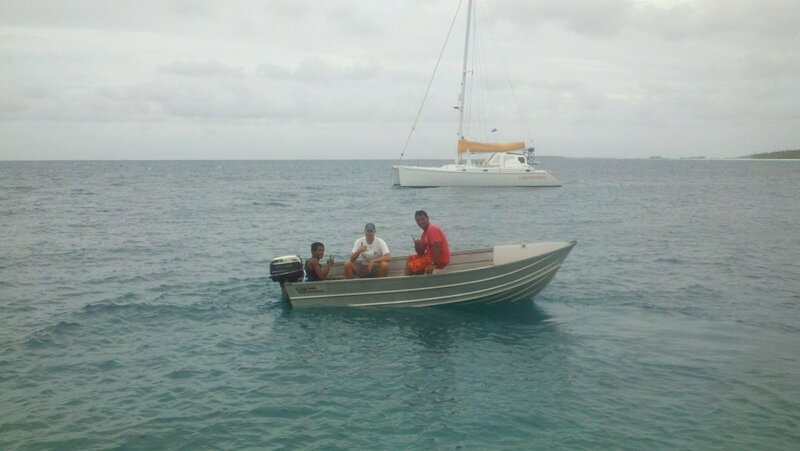 Three broken antique Johnson 25 horsepower outboards + 1 day = 1 running engine. We ended up removing a lower unit from three different engines trying to find one that wasn't seized. Then swapped in the best looking parts from all three. Installing a lower unit with fresh oil on the best looking powerhead that hadn't run in years, but started on the first pull with fresh gas, plugs and tidbits of wiring. Panoramic looking toward the lagoon. Dressed in as much white as we could muster for 'White Sunday' the first Sunday of the month. Three services to enjoy the singing are available every Sunday at 6:30, 10 and 2:30. Beuatiful example of a Rito hat that Penrhyn atoll is so famous for. 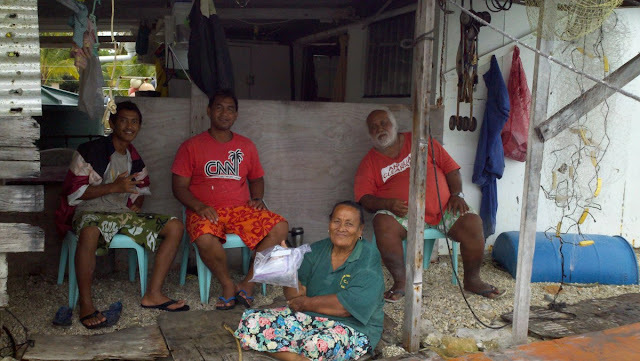 Penrhyn atoll, Te Tautua village welcome committee. Not visible in the photo are a half dozen sharks swimming with the kids. Sharing photos from my last visit to Penrhyn in 2006 on my Android Nexus 10 tablet. Mixing the concrete on shovel full at a time. Luckily, we had gas powered mixers. Dave hard troweling the new patio. This is a Black shark bite received while spear fishing. All the Penryhn locals warn you about the Black sharks. They aren't even three feet long, but they like to bite. Lemon or Nurse shark bite. This little boy when 2 years old jumped off the pier into a group of feeding frenzied sharks. One got him by the arm and a local man named Rio came to the rescue and remove the arm from the sharks mouth. Yikes! If you ask the local kids why this boy got bit they'll tell you it was because he was playing during church service. Checking out an alternate anchorage at the South end of the Te Tautua village motu. It's a perfect all weather anchorage for a shoal draft boat and only a 15 minute walk to the village. Where ever we went we had a gang of kids guiding the way. Cleaning. One of the many steps in making a rito hat. Step 2 after harvesting the palm fronds is stripping out the core. Typical assortment of sharks around the boat while at Penrhyn atoll.